Experiential training is the most valuable, and that’s what simulators can provide with endless availability. 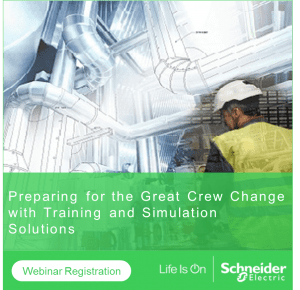 Scenario based simulation training raises the quality and value of existing training programs, and is applicable for many levels within the organization. Simulation based training need not be restricted to the control room or field operators within a facility. Organizing integrated case study training activities across the enterprise makes for great team training that offers a bigger picture of organizational success for operations, management and non-operating personnel such as procurement, admin and others. Advanced experiential learning through simulation can also be incorporated with other forms of training. Today almost every company has an in-house e-Learning system with many available courses. Sometimes these courses are voluntary and employees are gently nudged to take valuable courses. It’s also fairly standard for workers to have mandatory training courses in safety and regulatory compliance that must be taken on a regular basis. The challenge of training managers is to design a curriculum that is not easy to pass without diligent effort and attention, while remaining interesting. Scenario-based training embedded into computer-based training programs significantly changes the game by giving managers this capability. In addition, scenarios can be built upon modularly to satisfy training requirements for different types of personnel. Each building block of learning builds upon the last, and each has intrinsic value in satisfying objectives experientially. In Scenario based training, a trainee accesses a course element through the company’s eLearning platform. The trainee engages in training activities such as custom eLearning, videos, and various references. As an example, a trainee must learn how to start a centrifugal compressor. First, knowledge objectives must be satisfied. The trainee learns that it is important to open the suction and discharge valves and anti-surge recycle valve before starting the electric motor. Once the requisite knowledge is learned, the trainee accesses a procedure and simulation to perform the item. Second, performance objectives must be satisfied. The simulation requires that the trainee follow procedure and apply the knowledge learned in step one. If they cannot successfully accomplish the performance objective, the experience is repeated until the trainee proves competence through proper operation. Of course this is a very simple example but it describes a differentiated training experience that is available today – scenario based training. The operator must pay attention or he will not be able to pass. There will be no opportunity to skip the module and hope that you just get the multiple choice questions correct. By integrating dynamic simulation exercises into e-Learning courses the learning and development team can raise the value of the training and bring valuable insights to the entire enterprise, not just to the operations staff. For example, to work in a refinery all workers must understand that hydrocarbons are volatile and highly flammable. Standard e-learning content can teach the theory, but a simple dynamic simulation embedded into the theory course can demonstrate, for example, that a loss of overhead condenser cooling on a distillation column can lead to rapid system pressurization, flaring and potential explosion. Seeing and interacting with such a scenario will be enlightening and also unique. Everyone will interact with the dynamic model differently and see different responses. Some will take actions that leads to flaring, others a safe recovery and others an explosion. All will understand that they are working in a hazardous environment and be better informed and ultimately safer workers. CBT has value as a component of an overall training program. Combined dynamic simulation, CBT and On The Job Training (OJT) programs with local mentoring — tracked and managed through an integrated corporate LMS provides a comprehensive training platform that addresses the shortcomings of relying solely on a CBT platform. If you are interested in learning more about Workforce Optimization solutions for you and your crew and your enterprise, please attend my upcoming webinar on February 1st. You can also download our free whitepaper and watch our most recent customer success video.